The Apple iPad ships this week, and with its arrival, Apple may singlehandedly usher in the era of tablet computing—slate-style devices that look very unlike a typical computer. Bolstered by clever integration between hardware and software--as we've come to expect from Apple thanks to products like the iPhone--the iPad is a multi-purpose slate that holds the potential to be different things to different users. The various pricing options also reflect this: $499 (16GB), $599 (32GB), $699 (64GB). Add $130 to each of these Wi-Fi models for a 3G option in late April. It's true that the iPad resembles an oversized iPhone, but in some ways, that comparison diminishes all sorts of new potential. The iPad's screen is three times larger than that of the iPhone/iPod Touch, and that extra real estate primes the iPad for activities you couldn't even consider doing with the comparatively tiny iPhone/iPod Touch screen. Based on my initial launch-event hands-on with the iPad, this device's functionality exhibits both promise, and disappointment. The latter reflects its lack of flexibility as a full-on alternative to a netbook. Equipped with the same underlying operating system as the iPhone and iPod Touch, it comes as no surprise that the iPad immediately feels familiar. The main menu mimics that of the current iPhone OS, with four icons across and four rows down, plus Safari, Mail, Photos, and iPod icons in a row at the bottom. Icons have the same characteristics as those on the iPhone, and include Calendar, Contacts, Notes, Maps, YouTube, iTunes, App Store, and Settings. One new item is a dedicated icon for Videos--a logical addition given the device's roomy screen. Beyond that, you can add apps from the Apple App Store; a separate section will highlight apps optimized for iPad. 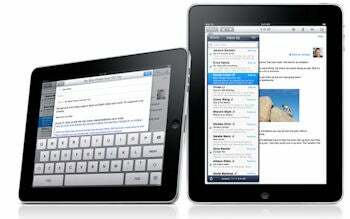 The 3G iPad won't have phone or traditional SMS functionality. The iPad packs in 802.11 a/b/g/n wireless, and as mentioned, a 3G option is expected in late April. 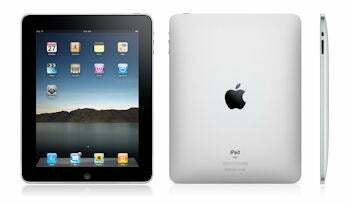 The iPad also has Bluetooth 2.1 + EDR, and is powered by Apple's 1-GHz A4 processor system-in-a-chip. The 9.7-inch LED-backlit screen uses IPS (in-plane switching) technology to achieve better color and contrast, and a wide 178-degree angle of view. 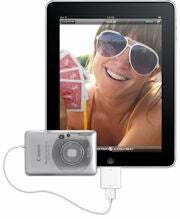 Its native resolution of 1024-by-768 pixels is sufficient for watching high-definition video, viewing photos using the slideshow feature, and for flicking-through content. The screen dominates the device, with a wide black bezel surrounding its fingerprint unfriendly oleophobic (oil-resistant) display. That bezel almost seemed like overkill, until I took the iPad in hand. Then, I found the bezel necessary, as that's where my fingers automatically gravitated in order to hold the device in my hands. While the iPad is super slim (just a half-inch thick), I actually had some difficulty handling it steadily in anything longer than short spurt. At 1.5 pounds, and measuring 9.6 by 7.5 by .5-inches, I found it too heavy to comfortably hold in one hand, which is troublesome if you plan on using it as an e-reader. Other e-readers, like Amazon's Kindle 2 or Spring Design Alex eReader, are much lighter in hand and therefore make for a much more comfortable user experience. I found using two hands much more viable, but my relatively small hands then had issues trying to reach across the expanse of the vertical unit's on-screen keyboard. Furthermore, I quickly realized my hands would tire in this position after reading just a few chapters of a long novel. Because of the larger display, pretty much all of the native applications we're used to viewing on the iPhone look and function better on the iPad. What I've seen so far of video playback of content purchased on iTunes appeared stunning on the iPad. Like the iPhone before it--and unlike what we expect from future, competing Windows-based tablet devices, the iPad has a minimalist design, with virtually no complexities and smooth, aluminum back. At the bottom of the iPad are the dock connector and the speaker grille. The sole buttons are Home Button centrally situated beneath the display, and the volume rocker on the side. The iPad is missing integrated expansion (via USB or flash memory, or both); and, so far as we know before shipping, it's missing multitasking--which the bigger screen practically begs for in this Facebook-driven, always-connected age. Yes, Apple will offer separate dock-connectors for accessing digital images via a USB port or an SD Card, but these are exorbitantly priced, and won't open the iPad for use in a way that mimics a more versatile netbook. And I find it stifling to think that a device capable of much more than my iPhone 3GS can't just take a USB flash memory drive and access any of an array of file types. This omission in particular is a serious limitation to iPad's functionality--and its ability to compete with less expensive, slightly heavier and bulkier, but more full-featured netbooks. A little more on the iPad's integrated input capabilities. 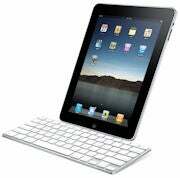 Simply put, if you plan to do a lot of typing, the iPad's touch keyboard is no match for the physical keyboard found on a netbook. The touch keyboard is a larger version of the iPhone's. But in the pre-shipping version of the iPad, the keyboard lacks the iPhone's letter magnification when you press a key, and I missed this visual cue immensely. It also lacks the haptic (vibration) feedback common to Android phones. So with no physical or visual feedback when you press a key, I found myself frustrated as I tried to pound out a long e-mail or note. According to what was known as of the launch event, the iPad runs iPhone OS 3.2 (which has not been released for actual iPhones yet). While the friendly, easy-to-use, interface gives the iPad an immediate built-in audience, the lack of a freshened design for the iPad feels like a let-down considering how long the iPad has been in development. There might be some as-yet unknown incremental differences between versions 3.1 and 3.2, but on the surface, the iPad's interface looked exactly like a blown-up version of my iPhone 3GS'. In my hands-on before the iPad shipped, the OS didn't translate very well from the much smaller iPhone to the iPad. It's not so much about the touch aspect of the interface; in fact, navigating by touch is a huge benefit on the large screen, and superior experience to, say, the joystick-based navigation of the comparably sized, non-touch Amazon Kindle DX screen. But images, icons, and text weren't as crisp as I'd expected on the early model at the launch event's pre-production model. At times, I found the experience much like watching standard definition video on an HDTV, in that some aspects of the operating system's visuals didn't appear optimized for the iPad's display. I'll update this review after seeing the shipping product later this week. On the whole, Apple has done a good job of optimizing its built-in core apps for the iPad's large screen. As a photo viewer, the iPad shines. Photos looked superb on the iPad's display, and it uses all of the familiar multitouch gestures (flick, pinch to zoom) found on the iPhone's photo app. The iPad's ample screen showcase images well, and it permits you to preview many more images, more easily than on the smaller iPhone. The iPad's photo application is much better than the iPhone's, too, with on-the-fly slideshow creation (complete with transitions). Simply choose from among five transitions and pick the music you'd like to add (if any), and you're off. I don't see the iPad replacing inexpensive digital photo frames, but I certainly do understand how an iPad might double as a photo frame while it's standing upright in its dock. Another convenience: The photo app provides different ways of viewing the images (including sorting by places, people, events, and a mini-thumbnail bar at the bottom of the screen to jump quickly to other photos in the album). Unfortunately, the sorting capabilities will only work if you're using iPhoto--which means that those of who use any number of alternative imaging applications for the PC or the Mac (the majority of potential iPad users) are left in the dark with regard to those features. And how convenient it is to use the photo viewer for non-Mac users remains a question I look forward to answering when I can try iTunes for the PC with the shipping iPad. The e-mail app has been redesigned to take advantage of the spacious screen, too. For example, when in landscape mode, the e-mail app shows recent messages and a search bar at the left, and displays the selected message at the right--an approach that's not viable on the iPhone's smaller screen. The Calendar app benefits greatly from the iPad's display. Now, calendar entries are more readable, and the day and weekly views in particular look terrific. For example, in the weekly view, a drop-down menu makes it simple to switch among different calendars for your household. 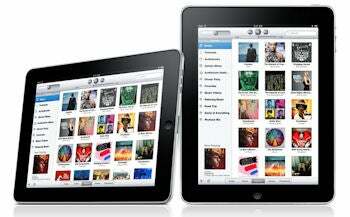 The reimagined, highly visual iPod library looks very different on the iPad. In landscape view, you can easily see video-playback chapters, or view info about the video while previewing it in a pane at right. hows how video-playback chapters look in the Video player. 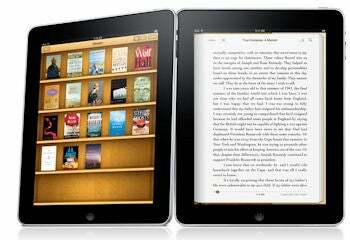 One of the big pitches for iPad is for using it as an e-reader. And here is where iPad has the potential to be divisive. On the one hand, Apple clearly has the retail digital download model down pat with its iTunes store, so it's reasonable to assume that Apple may be able to entice consumers to shop for digital books, too. The bigger question is, how well does the iPad--with its glossy, glarey screen and slightly greater weight--do as an e-reader? Stay tuned for our full review of the shipping iPad, complete with a report of the Apple iBookstore and iBooks reader experience. My first impressions on the subject? The iPad makes it easy to browse your library books, represented visually by colorful book covers. The iBooks app, in horizontal mode, allows you to have two pages on the display at once--and it tries to mimic the experience of reading a book, right down to the visuals of additional pages on the left and right, and the darker area in the center, where the spine would be. I could easily scroll along the bottom of a book to jump to a specific page, with no notable delay when doing so. And I particularly liked how the iPad showed the page number, and out of how many, you were jumping ahead to; and, how it indicated the number of pages remaining in the chapter. (Just one more chapter before I go to sleep...I swear!) Dedicated e-readers could learn something from this part of iBooks' design. I found the iBooks reader's page-turn animations are both cool and annoying. The flicker for a quick page turn bugged me--nevertheless, it was better than suffering through the multiple flashes that one endures on most E-Ink readers as they try to redraw the page. One of the big concerns among developers and users before the iPad's announcement was whether iPhone apps would work on the device. Thankfully, they do, but the experience on the iPad isn't exactly ideal. You can either view an iPhone app as a small window or doubled to fill the display. On the pre-shipping iPad, I demoed the 3D-intensive Assassin's Creed and Oregon Trail apps, and was immediately put off by the obvious pixelation. Text in Facebook iPhone app looked fuzzy, too. Again, the analogy here is to standard definition content versus high-definition content on an HDTV. Another concern remains Apple's lack of Adobe Flash support, which means as-is services like Hulu and the full YouTube catalog can't be viewed on the iPad. Even as some sites switch to HTML 5, the lack of Flash is disappointing, given the format's prevalence across the Web. Based on my initial handling of the pre-shipping iPad, I was a tad underwhelmed: The reality is that the iPad looked and behaved like an iPhone (or iPod Touch) on steroids--and that's not always a good thing given the potential for the iPad to make a run for replacing my netbook--or even my PC--for certain activities. I'm intrigued--but need to see the iPad-specific apps in use, and try the shipping version to get more of a feel of just how the iPad complements the existing pantheon of mobile computers. And how well it works together with the iPhone, in terms of sharing both data and apps. Look for an update to this review when the iPad launches on April 3.